On 27 June 2018, 171 provinces, districts, and towns in Indonesia held simultaneous regional elections (Pilkada). While mass rallies and public meetings are still featured in regional elections, new forms of political campaigns facilitated by the Internet and social media emerged. Interestingly, political campaigns were more interactive as they included more active participation from candidates’ supporters which took up diverse forms of media such as memes (parodied images) or hashtags on Facebook and Twitter; video blog or short films on YouTube channel; as well as photographs on Instagram. These campaigns often appropriated pop culture icons while combining strong political messages. It seems that parodied images or short films articulate powerful political events and popular interests well and are more likely to be able to generate symbolic resonances and discursive effects, which are relayed and echoed throughout the Internet and social media. 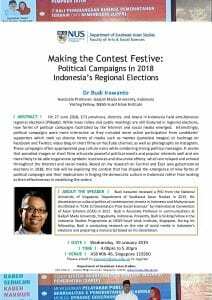 Based on my research on Central and East Java gubernatorial elections in 2018, this talk will be exploring the context that has shaped the emergence of new forms of political campaign and their implications in forging the democratic culture in Indonesia rather than looking at their effectiveness in mobilizing the voters. Budi Irawanto received a PhD from the National University of Singapore, Department of Southeast Asian Studies in 2015. His dissertation on cultural politics of contemporary cinema in Indonesia and Malaysia was shortlisted in “ICAS 10 Dissertation Prize Social Sciences” by International Convention of Asian Scholars (ICAS) in 2017. Budi is Associate Professor in communications at Gadjah Mada University, Yogyakarta, Indonesia. Presently, Budi is Visiting Fellow in the Indonesia Studies Programme at ISEAS-Yusof Ishak Institute, Singapore. During his fellowship, Budi is conducting research on the role of social media in Indonesia’s elections and preparing a manuscript based on his dissertation.